Here comes the new Federal Bank careers making opportunity in India for all Indian candidates who are looking to make a bright career in banking line. We know that Federal Bank, is one of India’s leading Private Sector Bank having many branches all over India. Bank wants to recruit active and brilliant youths from India, who seek to be the future industry leaders and possess the right skills and boldness to outshine in association banking and client facing roles, to team up as Officers (in Scale I) & Clerks. 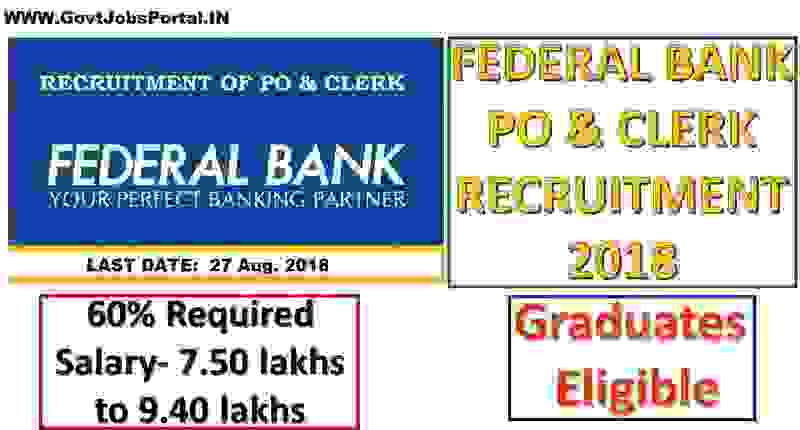 So all the eligible applicants are advised to apply online for this federal bank recruitment process in between 14th Aug. 2018 and 27th Aug. 2018 (both days of the Date are inclusive) through the official Bank’s website www.federalbank.co.in after carefully going through the instructions contained in this advertisement. More information related to this Federal Bank careers making opportunity we shared below in this article. Please read the whole article carefully for detailed information related to this Federal bank recruitment process. Age Limit: Only those applicants are eligible for applying this Federal bank careers making opportunity whose age is less than 26 years as on 01.07.2018. Education: Indian candidates having a Post-Graduation degree in any stream with minimum 60% marks from a recognized University are eligible to apply this federal Government jobs. · Candidates should have completed their Post-Graduation during the academic years 2016-17 or 2017-18 (passing out year of their post-graduation should be 2017 or 2018). · Candidates should have completed their academics (from 10th onwards) in regular mode of study. · Candidates should have a consistent academic record of minimum 60% marks from class 10th onwards (for 10th, 12th, Graduation and Post-Graduation). Pay Band: Starting Basic Pay applicable to Officers (in Scale I) is Rs. 23700 in the scale of pay `23700 - 980/7 - 30560 – 1145/2 - 32850 – 1310/7 – 42020. The Cost to Company per annum would be a minimum of ` 7.50 Lakhs and maximum of ` 9.40 Lakhs depending upon the place of posting and other factors. Age Bond: Candidates shall not exceed 24 years as on 01.07.2018 (candidates should be born on or after 01.07.1994) for being eligible to apply for the post of Clerks. Education: Candidates having a Graduation or Post-Graduation qualification in any stream with at least 60% marks from a recognized University can apply for this bank recruitment process. · Candidates with highest qualification as Graduation should have completed their Graduation during the academic years 2016-17 or 2017-18 (passing out year should be 2017 or 2018). · Candidates with highest qualification as Post-Graduation should have completed their Post-Graduation during the academic years 2016-17 or 2017-18 (passing out year should be 2017 or 2018). · Candidates should have a consistent academic record of minimum 60% marks from class 10th onwards (Graduates- 60% for 10th , 12th & Graduation) & (Post Graduates - 60 % for 10th , 12th, Graduation & Post–Graduation). Pay Band: Starting Basic Pay (applicable to Clerks) is ` Rs.13075 in the scale of pay ` 11765 – 655/3 - 13730 – 815/3 - 16175 – 980/4 - 20095 – 1145/7 - 28110 – 2120/1 - 30230 – 1310/1 – 31540. The Cost to Company per annum would be a minimum of ` 3.99 Lakhs and maximum of ` 4.41 Lakhs depending upon the place of posting and other factors. Job Location under this Federal Bank Careers Making Opportunity: Candidates selected for the post of Officers or Clerks shall be posted in any of the Branches/Offices of the Bank depending upon the administrative requirements. What is the Mode of Selection for these Federal Government jobs? Federal Bank Recruitment department will be selected on the basis of Online Aptitude Test, Group Discussion and Personal Interview. The online aptitude test will be 5 followed by a psychometric questionnaire for a maximum duration of 15 minutes. The procedure for selection will be conducted in the different exam centers depending upon the number of candidates who are going to apply for this federal bank careers making opportunity 2018. 1. To apply these bank jobs for various job profile candidates have to submit the online applications by log on to the official website of the federal Bank’s. The web address is as follow: “www.federalbank.co.in”, inside the website you have to follow the link ‘Careers’, click ‘Current Openings’ tab and click the link ‘Recruitment Process 2018 -19’. You have to read all the eligibility criteria conditions before clicking on the APPLY ONLINE link. We explained all the criteria above in this article. 2. Candidates who wants to register an application, have to choose the tab ‘Click here for New Registration’ and after that they have to enter Name, Contact details and Email-id in that online form. After filling up those field a Provisional Registration Number and Password will be generated by the automated computer system and displayed on your computer screen. Applicant have to note that Registration Number and Password for login purpose. An automated Email & SMS indicating the Provisional Registration number and Password will also be sent to your mail ID as well to your Mobile number which you used during the registration. 3. Applicant should have entered his/her own name His/her Father/ Spouse/Mother etc name correctly. The name should be same as on the Certificates/ Mark sheets/Identity proof. Any change/alteration found may disqualify the candidature. 4. Applicants who wants to apply this federal bank careers making opportunity must have to upload his/her Photo & Signature as per the specifications. After Filling up all the Detail online candidates have to click on the SUBMIT button and that’s it You are done with the online registration process related to this Federal Bank careers making Opportunity 2018. 14TH Aug. 2018 is the Opening Date to apply online. 27th Aug. 2018 is the Last Date to apply.